Dear Reader, if you like this type of trip recap, please let me know in the comments. We have a lot of stories to share and much of it applies to successful living strategies. Our little piece of paradise for a week and a half. Flores is in the distance. We were pet sitting for a fellow personal finance blogger and had felt comfortable making the trek because I’d travelled to nearly twenty countries so far. Of course, I took care of doing some research, but I didn’t do as much as I likely should have because I thought all we had to do was get there, get settled and then we could find any information we needed at that point. We're in the age of on-demand information, right? First, I should say that we did not land in Guatemala. We landed in Belize because the flights from Winnipeg to Belize were much cheaper than going to Guatemala directly. Since we were going to land in Belize anyway, we decided to make our trip longer and enjoy the Carribean side of that country because we like to snorkel and scuba dive. When we got to our hotel in Belize, we found out that our MasterCard, though used to make the reservation, would not be an acceptable payment option for our five-night hotel stay. Only cash would do (Belize or US dollars to be specific). This very unexpected occurence put a significant dent into the nearly $900 USD we had brought to last us the full 19 days in Central America. Well, we thought, no big deal. We’ll just get more money out of the ATM. So we paid the hotel bill up front, as required. And then we found out that my ATM card did not work in Belize. No problem, we’ll just be careful how much cash we spend and use our credit cards as much as possible. Good plan, right? But no. We found that most places that are reasonably priced in Belize have a cash only policy or, if they do accept credit cards, charge a hefty premium for the privilege. So, unless we wanted to pay way more for what we were buying at any given time, cash was king. You could say that logic makes us cheap, and you'd be right: I refuse to pay more than I have to for a similar or identical level of service. View from the very pretty town of Flores. On day six, we travelled to Guatemala. When we arrived at the old market terminal to, after more than a six hours of travel, transfer from the main bus line to the local tuk-tuk, we found out that we had about ten minutes to grab some snacks to last us until the next day when we'd have the time to pick up more provisions. While in the busy, cluttered market, we purchased some fruit and peanuts for snacks for the evening and following morning. We paid with precious USD and received some Quetzales (the Guatemalan currency) as change*. We felt confident that we’d be able to come back to the city of Santa Elena (& town of Flores) the next day to sort out the money situation, as we’d noticed a bank near the market. We'd be fine, right? We had 61 Quetzales (about $8 USD), had no idea how to get to another bank that had an ATM and we didn't have access to the internet. And, because everyone has a smartphone now, we were unable to find a map, an essential tool in a very chaotic environment. The teller, trying to be of some assistance, told us we'd likely have some luck at the airport. We paid a precious 20 Quetzales to get to the airport. At the airport, we found no ATM and that only USD could be exchanged for the local currency…Canadian dollars were worthless (we hadn’t intended to convert Canadian, but that’s the only "paper money" we had available for exchange). 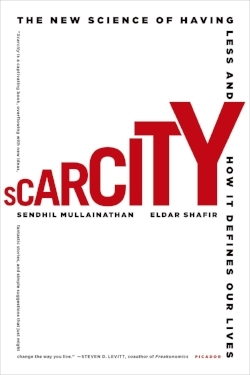 — Sendhil Mullainathan and Eldar Shafir, "Scarcity" (2013), p. 7. We stood at the counter, dumbfounded. Much to the teller’s chagrin, we wouldn’t leave. We were standing there, unable—or unwilling—to comprehend the situation. We’d never run out of money like this before (and no, I was not touching our “get outa Dodge” money). Seeing as we were not leaving, she came back to the counter and suggested we go see one of the airline attendants across the small terminal because she spoke reasonable English and might be able to help us. We were grateful for the tip, despite her reluctance to offer it (she really just wanted us to leave, and it worked). The young lady at the counter was AMAZING! Not only did she tell us where we could find an ATM, but she drove us to the mall that was five minutes away since she was about to go on break and was headed there anyway. We felt like lottery winners who just needed to hear the last number called to know they'd won. We were high on anticipation. Once at the mall, we went to the bank. Again, no luck converting our Canadian currency BUT there was an ATM and, in looking for our passports during the bank visit (they always need to see our passports at the bank), we found Mr. F2P’s ATM card! We had tucked it away for safe keeping in case I lost mine—never considering the possibility that it wouldn't even work in the first place! We tried it first, of course, and EUREKA! It worked! As an aside: We also took the chance to try my ATM card and it still did not work. Note to self: always verify that the ATM I’m currently using can be used abroad! I’m sharing this story because this is the first time Mr. F2P and I have experienced money scarcity together. The last time we individually experienced it was right after high school, a time when so many of us have no money or very little of it and it feels pretty normal at that stage of life (plus, many of us as teenagers still had a roof over our heads and food in the fridge, thanks to mom and dad). The feelings we experienced were many: fear, uncertainty, vulnerability...panic. We couldn’t think about anything else. It monopolized our thoughts and caused a kind of mental tunnel vision. Nothing else mattered until we had the money situation resolved. Our last day in Guatemala. The food at this little café was divine. The best breakfast ever. The day before we left Guatemala, we spent the day in Flores—a very pretty place I highly recommend visiting because it’s very tourist friendly, which I can’t say about every place we visited in the country. That’s where we came across another travelling Canadian from Vancouver. I don’t recall his name but he approached us because he recognized Mr. F2P's shirt as Canadian. He asked if we could exchange some Quetzales in return for Canadian dollars. He looked desperate. Boy, did we understand that feeling. Needless to say, we made his day. As I hinted at in the intro, that’s not our only time experiencing scarcity in Guatemala. We also experienced food scarcity, security scarcity, communication scarcity and transportation scarcity. If you’re interested in more scarcity stories, let me know in the comments and I’ll be happy to share more. *We got totally ripped off in the exchange, but I didn’t feel I could negotiate, as the bus was about to leave and we didn’t want to miss it. **Yes, we should have been able to take a cash advance on a credit card, but that was going to be the absolute last resort. You know we're cheap, right?